You are here: Home > Rock & Roll Hall Of Fame Inducts Sister Rosetta Tharpe! Rock & Roll Hall Of Fame Inducts Sister Rosetta Tharpe! Rock & Roll Hall Of Fame Inducts Gospel Great & The Godmother of Rock and Roll Sister Rosetta Tharpe! The 33rd Annual Rock & Roll Hall of Fame Induction Ceremony will take place on Friday, April 14, 2018 in Cleveland. Ticket on-sale dates will be announced in January and the ceremony will be broadcast on HBO. 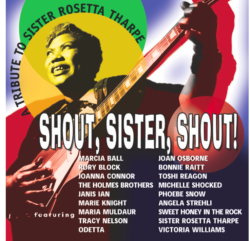 It happened almost 15 years after we released our recording Shout Sister Shout, A Tribute To Sister Rosetta Tharpe. In the 21st century things would be different! * In 2007 – Gayle Wald’s Shout, Sister, Shout! The Untold Story of Rock‑and‑Roll biography came out. In 2011 – A historical marker is installed in front of Rosetta house on Master Street in Philadelphia. A celebration accompanies its unveiling. In 2014 Sister Rosetta Tharpe was the subject of a PBS Masters Series. 2016 – The musical Marie and Rosetta is performed in New York City and more cities will be added. 2017 – The musical Shout Sister Shout is performed in Pasadena. Sister Rosetta has four videos with over 1 million viewsSister Rosetta Tharpe was one of the most important musicians of the 20th century. * Her recordings sold millions of copies throughout her career including Strange Things Happening Every Day, Up Above My Head, Down By The Riverside and Rock Me (title of a feature film in the works). * Was one of only two Gospel artists to make records for the troops during WW II. * In 1951 Sister Rosetta’s wedding took place at Griffith Stadium in Washington D.C.. Over 20,000 paying customers attended, and a concert was recorded and later released as an album. * During the 1960’s she would tour the U.K. and Europe influencing a generation of young rockers with her wild guitar style.